For other uses, see ITT (disambiguation). ITT Inc., formerly ITT Corporation, is an American worldwide manufacturing company based in White Plains, New York. The company produces specialty components for the aerospace, transportation, energy and industrial markets. ITT’s three businesses include Industrial Process, Motion Technologies, and Connect and Control Technologies. ITT has approximately 10,000 employees in more than 35 countries and serves customers in well over 100 countries. The company’s long-standing brands include Goulds Pumps, Cannon connectors, KONI shock absorbers and Enidine energy absorption components. The company was founded in 1920 as International Telephone & Telegraph. During the 1960s and 1970s, under the leadership of CEO Harold Geneen, the company rose to prominence as the archetypal conglomerate, deriving its growth from hundreds of acquisitions in diversified industries. ITT divested its telecommunications assets in 1986, and in 1995 spun off its non-manufacturing divisions, later purchased by Starwood Hotels & Resorts Worldwide. In 1996, the current company was founded as a spinoff of ITT as ITT Industries, Inc. It later changed its name to ITT Corporation in 2006. In 2011, ITT spun off its defense businesses into a company named Exelis, and its water technology business into a company named Xylem Inc. ITT Corporation changed its name to ITT Inc. in 2016.
International Telephone & Telegraph (ITT) was formed in 1920, created by brokers Colonel Sosthenes Behn and his brother Hernan Behn. The brothers had acquired the Puerto Rico Telephone Company in 1914 along with the Cuban-American Telephone and Telegraph Company and a half-interest in the Cuban Telephone Company. ITT's first major expansion was in 1923 when it consolidated the Spanish Telecoms market into what is now Telefónica. From 1922 to 1925 it purchased a number of European telephone companies. In 1925, ITT purchased several companies from Western Electric, as Bell has agreed to "divest" itself of its international operations. They included the Bell Telephone Manufacturing Company (BTM) of Antwerp, Belgium, which manufactured rotary system switching equipment, and the British International Western Electric, which was renamed Standard Telephones and Cables (STC). Compagnie Générale d'Electricité later purchased BTM; Nortel later purchased STC. In the 1930s, ITT purchased German electronic companies Standard Elektrizitätsgesellschaft (SEG) and Mix & Genest, both of which were internationally active companies and Romanian telecommunications monopoly Societatea Anonima Română de Telefoane. Its only serious rival was the Theodore Gary & Company conglomerate, which operated a subsidiary, Associated Telephone and Telegraph, with manufacturing plants in Europe. In the United States, ITT acquired the various companies of the Mackay Companies in 1928 through a specially organized subsidiary corporation, Postal Telegraph & Cable. These companies included the Commercial Cable Company, the Commercial Pacific Cable Company, Postal Telegraph, and the Federal Telegraph Company. On 3 August 1933 Hitler received in one of the first meetings with US businessmen Sosthenes Behn, then the CEO of ITT, and his German representative, Henry Mann. Antony C. Sutton, in his book Wall Street and the Rise of Hitler, makes the claim that ITT subsidiaries made cash payments to SS leader Heinrich Himmler. ITT, through its subsidiary C. Lorenz AG, owned 25% of Focke-Wulf, the German aircraft manufacturer, builder of some of the most successful Luftwaffe fighter aircraft. In the 1960s, ITT Corporation won $27 million in compensation for damage inflicted on its share of the Focke-Wulf plant by Allied bombing during World War II. In addition, Sutton’s book uncovers that ITT owned shares of Signalbau AG, Dr. Erich F. Huth (Signalbau Huth), which produced for the German Wehrmacht radar equipment and transceivers in Berlin, Hanover (later Telefunken factory) and other places. While ITT - Focke-Wulf planes were bombing Allied ships, and ITT lines were passing information to German submarines, ITT direction finders were saving other ships from torpedoes. In 1943 ITT became the largest shareholder of Focke-Wulf Flugzeugbau GmbH for the remainder of the war with 29%. This was due to Kaffee HAG's share falling to 27% after the death in May of Kaffee HAG chief, Dr Ludwig Roselius. OMGUS documents reveal that the role of the HAG conglomerate could not be determined during WWII. In 1951, ITT purchased Philo Farnsworth's television company to break into that market. At the time Farnsworth was also developing the Fusor fusion reactor, which was funded by ITT until 1967. Also in 1951, ITT bought a majority interest in the Kellogg Switchboard & Supply Company, founded in 1897 as a pioneer in "divided-multiple" telephone switchboards, and bought the remaining shares the next year. ITT changed the company's name to ITT Kellogg. After merging Federal Telephone and Radio Corporation into ITT Kellogg and combining manufacturing operations the name was again changed to ITT Telecommunications, eventually reverting to ITT Kellogg. One prominent subsidiary of this was the American Cable and Radio Corporation, which operated the transatlantic cables of the Commercial Cable Company, among other ventures. It bought Philadelphia based heating and air conditioning manufacturer John J. Nesbitt Inc. In 1968 the company purchased Levittown homebuilder Levitt and Sons for a reported $90 million. In 1972, the KONI Group, manufacturer of shock absorbers was added to the list of acquisitions and remains a leader worldwide as the quality shock absorber specialist, focusing solely on high performing suspension-damping technology for Cars, Racing, Specialty Trucks, Busses, Trailers, Locomotives and Railway Rolling Stock. International telecommunications manufacturing subsidiaries included STC in Britain and Australia, SEL (today part of Nokia Germany) and Intermetall [de] Gesellschaft für Metallurgie und Elektronik mbH (acquired from Clevite in 1965; since 1997 Micronas) in Germany, BTM in Belgium, and CGCT and LMT in France. These companies manufactured equipment according to ITT designs including the (1960s) Pentaconta crossbar switch and (1970s) Metaconta D, L and 10c Stored Program Control exchanges, mostly for sale to their respective national telephone administrations. This equipment was also produced under license in Poznań (Poland), and in Yugoslavia, and elsewhere. ITT was the largest owner of the LM Ericsson company in Sweden but sold out in 1960. Alec Reeves invented pulse-code modulation (PCM), upon which future digital voice communication was based, and Charles K. Kao pioneered the use of optical fiber, for which he was awarded the 2009 Nobel Prize in Physics. In 1959, Harold Geneen became CEO. Using leveraged buyouts, he turned the minor acquisitions of the 1950s into major growth during the 1960s. In 1963, ITT attempted to purchase the ABC television network for $700 million. The deal was halted by federal antitrust regulators who feared ITT was growing too large. In order to continue growing while not running afoul of antitrust legislation, it moved to acquire companies outside of the telecommunications industry. Under Geneen, ITT bought over 300 companies in the 1960s, including some hostile takeovers. The deals included well-known businesses like the Sheraton Hotel chain, Wonder Bread maker Continental Baking, Rayonier, and Avis Rent-a-Car. ITT also absorbed smaller operations in auto parts, energy, books, semiconductors and cosmetics. In 1966, ITT acquired Educational Services, Inc., an operator of for-profit schools, which became ITT/ESI. When ITT attempted to acquire The Hartford insurance company in 1970, the US Justice Department filed suit, and ITT agreed to divest assets equal to those of Hartford's, including Avis. ITT's sales grew from about $700 million in 1960 to about $8 billion in 1970, and its profit from $29 million to $550 million. However, when the higher interest rates started eating away at profits in the late 1960s, ITT's growth slowed considerably. In the late 1960s, the British electronics manufacturer Kolster-Brandes, KB for short, had run into trouble with its color television manufacturing, and turned to ITT for help; ITT bought out the company, and for a while, UK products were badged "ITT KB" then eventually just ITT. 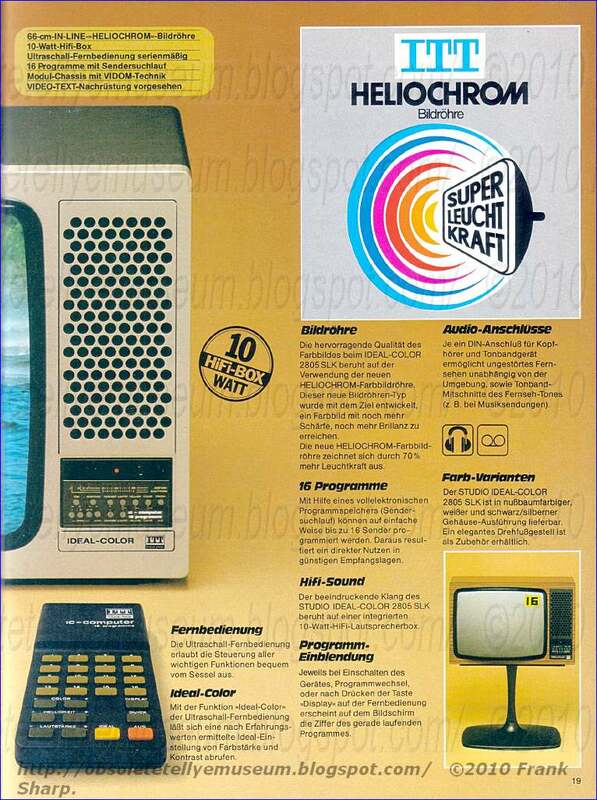 By the late 1970s, ITT had a good presence on the UK domestic electrical market in television, audio and portable radio products. João Goulart was the president of Brazil. The US government, including President Lyndon Johnson, Defense Secretary Robert S. McNamara, ambassador Lincoln Gordon, and others, most notably the CIA, capitalized on the Cold War anticommunist hysteria at the time to portray Goulart as a communist, even though they all admitted that he was not. In fact, it was Goulart's approval of the nationalizing of Brazil's resources and attitude of independence from Washington that fueled their willingness to help the Brazilian corporate-military group overthrow him. This ITT's president, Harold Geneen, was friends with the Director of Central Intelligence, John McCone. The CIA performed psyops against Goulart, performed character assassination, pumped money into opposition groups, and enlisted the help of two organizations: the AFL-CIO; and the Agency for International Development, which was implicated in providing torture training and equipment to Brazilian police. The 1964 Brazilian coup d'état exiled Goulart and the military dictatorship of Humberto de Alencar Castelo Branco took over. McCone went to work for ITT a few years later. The dictatorship, which killed hundreds and arrested thousands, tortured more than 10,000, and exiled thousands more innocent civilians, lasted until 1985. ITT became enmeshed in scandal in connection with the 1972 Republican National Convention. In May 1971, ITT president Geneen pledged $400,000 to support a proposal to hold the convention in San Diego; only $100,000 of the contribution was publicly disclosed. The Republican National Committee selected San Diego as the site in July 1971. However, on February 29, 1972, newspaper columnist Jack Anderson disclosed an interoffice memo from ITT lobbyist Dita Beard to ITT vice president Bill Merriam, dated June 25, 1971. The memo appeared to draw a connection between ITT's contribution to the convention and the favorable settlement of a Justice Department antitrust lawsuit. The resulting scandal, including a Senate investigation and the threat of criminal charges, caused ITT to withdraw its support for the San Diego convention. That combined with a shortage of hotel space and problems with the proposed venue led the RNC to move the convention to Miami. Special prosecutor Leon Jaworski investigated the case but ultimately concluded there was no evidence of criminal conduct by ITT. In 1970, ITT owned 70% of CTC (the Chilean Telephone Company, now Movistar Chile) and funded El Mercurio, a Chilean right-wing newspaper. Declassified documents released by the U.S. Central Intelligence Agency in 2000 reveal that the company financially helped opponents of Salvador Allende's government prepare a military coup. On September 28, 1973, an ITT building in New York City, was bombed by the Weather Underground for involvement in the 1973 Chilean coup d'état, which overthrew the government in Chile. In March, 1977 Lyman C. Hamilton was appointed CEO, and Geneen became Chairman of the Board. In June 1979, while Hamilton was in Asia, Geneen became aware of Hamilton's plans to divest ITT's European consumer goods business, and lobbied his fellow board members to dismiss Hamilton. In July 1979 Rand Araskog became CEO. Shortly thereafter, Araskog insisted that the board remove Geneen as Chairman, though Geneen remained on the board for four more years. Araskog over the next two decades dismantled much of ITT, selling most of its holdings. Starting in 1977, ITT set out to develop an ambitious new Digital Telephone Exchange, System 1240 (later System 12), which reportedly cost US$1 billion. Fortune reported that "Araskog focused the company on an all-consuming push to develop and market System 12" and "shoveled profits from good businesses into System 12's insatiable maw". System 12 was intended to operate in all markets, and in all modes, from local switches to long distance. The design was done at the Advanced Technology Center (Stamford, Connecticut and then Shelton, Connecticut). Manufacturing was by ITT's subsidiaries, such as BTM in Belgium, where the first production system was installed at Brecht, in August 1982. Initial sales, particularly in Europe and Mexico, were strong, but the new system took longer than expected to integrate, with further losses. Against the advice of headquarters, ITT Telecommunications (ITT Kellogg) in Raleigh, North Carolina undertook the conversion to the US market, and although sales were announced in 1984 and 1985, the attempt ultimately failed, in early 1986. In 1986 ITT sold its international telecommunications product businesses, including ITT Kellogg, to the Alcatel Alsthom subsidiary of Compagnie Générale d'Electricité (CGE), forming Alcatel N.V.(Netherlands). At the time this was the world's second-largest telecommunications company. (Alcatel Alsthom S.A. subsequently merged with Lucent to become Alcatel-Lucent). ITT initially held a 37% stake, but in March 1992 it sold its remaining 30%. "The move ended the involvement of ITT in the telephone industry." ITT Educational Services, Inc. (ESI) was spun off through an IPO in 1994, with ITT as an 83% shareholder. (In September 2016 ESI announced plans to close all of its 130 Technical Institutes in 38 states, because their students were no longer eligible for Federal aid.) ITT merged its long distance division with Metromedia Long Distance in March 1989, creating Metromedia-ITT. Metromedia-ITT would eventually be acquired by Long Distance Discount Services, Inc. (LDDS) in 1993. LDDS would later change its name to Worldcom in 1995. ITT Corp. – In 1997, ITT Corp. completed a merger with Starwood Hotels & Resorts Worldwide who was interested in Sheraton. Starwood sold ITT World Directories to VNU. By 1999, ITT completely divested from ITT/ESI; however, the schools still operated as ITT Technical Institute using the ITT name under license until its demise in 2016. Also in 1999, ITT Corp. dropped the ITT name in favor of Starwood. ITT Hartford (insurance) – Today ITT Hartford is still a major insurance company although it has dropped the ITT from its name altogether. The company is now known as The Hartford Financial Services Group, Inc.
ITT Industries – ITT operated under this name until 2006 and is a major manufacturing and defense contractor business. On July 1, 2006, ITT Industries changed its name to ITT Corporation as a result of its shareholders vote on May 9, 2006. In 2011, ITT Corporation spun-off and became Exelis. Harris acquired Exelis in 2015. In March 2007, ITT Corporation became the first major defense contractor to be convicted for criminal violations of the US Arms Export Control Act. The fines resulted from ITT's outsourcing program, in which they transferred night vision goggles and classified information about countermeasures against laser weapons, including light interference filters to engineers in Singapore, the People's Republic of China, and the United Kingdom. They were fined US$100 million although they were also given the option of spending half of that sum on research and development of new night vision technology. The United States government will assume rights to the resulting intellectual property. In its investigation and subsequent ruling the United States Department of Justice found that the corporation went to significant lengths to circumvent rules regarding the exports including setting up a front company. According to U.S. Attorney John L. Brownlee, the company fought the investigation in order "to essentially run out the clock on the statute of limitations." An agreement was reached on June 26, 2007, for ITT to acquire privately held International Motion Control (IMC) for $395 million. The deal was closed and finalized in September 2007. An announcement was made September 14, 2010, to close the Cleveland site. An agreement was reached September 18, 2007, for ITT to buy EDO Corporation for $1.7 billion. After EDO shareholders' approval, the deal was closed and finalized on December 20, 2007. On April 16, 2009, ITT announced it has signed a definitive agreement to acquire Laing GmbH of Germany, a privately held leading producer of energy-efficient circulator pumps primarily used in residential and commercial plumbing and heating, ventilating and air conditioning (HVAC) systems. On January 12, 2011, ITT announced a transformation to separate the remaining company into three publicly traded independent companies. On July 14, 2011, ITT announced the names of the three companies: the Industrial Process & Flow Control division to retain the name ITT Corporation, the Water & Waste Water division will be named Xylem, symbol XYL (a reference to xylem tissue in plants), and the Defense division to be named Exelis Inc., symbol XLS. Current ITT stockholders will own shares in all three companies following the spinoff. In 1929 ITT's headquarters were at (75) 67 Broad Street, Manhattan, New York, New York. "During World War II the building was a hub for communications with American submarines operating in the Atlantic Ocean." From 1961 to 1989, ITT's headquarters were at 320 Park Ave., New York. 1330 Sixth Avenue in Manhattan, New York City, which was ITT's corporate headquarters prior to its merger with Starwood Hotels & Resorts, was originally owned by the ABC Television Network, which ITT attempted to acquire in 1963. After a financial downturn, ABC moved out of the building known as "Brown Rock" and sold it to a Japanese conglomerate which then in turn leased a good portion out to ITT Corporation. ITT Avionics was a division of ITT Corporation in Nutley, New Jersey. A 300-foot research tower at ITT Avionics was built in the 1940s for scientists for microwave communications systems. Research at the tower had stopped in the 1970s. In 1996 the tower was demolished with explosives to prepare the site for sale. In 1991 the company won a $19.6 million contract from the United States Air Force to develop the "intraflight data link", a communications system for "tactical airborne forces". In 2004 they were awarded a $24.9 million contract from the Naval Air Systems Command Weapons Division for engineering software support services provided to the Tactical Aircraft Electronic Warfare Integrated Program Team at Point Mugu, California and China Lake, California. Through their then subsidiary Schaub Elektrik Lorenz, ITT manufactured consumer products under the ITT Schaub-Lorenz brand, such as Touring radio receivers and Ideal Color television sets employing Heliochrom picture tubes. Some television models feature the Ideal-Computer cartridge system, featuring a slot suitable for housing an ultrasonic remote control (acting as front panel buttons while docked), a teletext decoder, or Tele-Match video game dedicated consoles (unrelated to the "ITT Telematch Processor" console, a rebrand of the Fairchild Channel F); the Ideal-Computer system was licensed to other German producers of its time. ITT Schaub-Lorenz was also behind the Digivision, the first television employing digital signal processing of the image.. In 1986 throughout the following year, the ITT Telecommunications division (which included Schaub-Lorenz) was transferred to Alcatel through the French CGE, then in 1988 the consumer electronics division was further spun off and sold to Nokia, who sold some products under the ITT Nokia brand. Nokia closed their German TV factories in 1996, although their use of the ITT brand may have been discontinued earlier. Since 2006, the ITT brand and logo are licensed to the Karcher corporation, which is not part of the ITT group. In 2007, ITT was awarded a $207 million initial contract by the Federal Aviation Administration (FAA) to lead a team to develop and deploy the Automatic Dependent Surveillance – Broadcast (ADS-B) system. ADS-B is a key component of the FAA's NextGen air traffic control modernization program intended to increase safety and efficiency to meet the growing needs of air transportation. ITT is responsible for overall system integration and engineering and under contract options will operate and maintain the system after deployment through September 2025. The ITT team includes its partners AT&T, Thales North America, WSI, SAIC, PricewaterhouseCoopers, Aerospace Engineering, Sunhillo, Comsearch, MCS of Tampa, Pragmatics, Washington Consulting Group, Aviation Communications and Surveillance Systems (ACSS), Sandia Aerospace and NCR Corporation. On September 6, 2008, the ITT-built imaging payload was launched aboard the GeoEye-1 satellite to provide high-resolution earth imaging. The satellite has the ability to collect images at 0.41-meter panchromatic (black and white) and 1.65-meter multispectral (color) resolution. GeoEye-1 can precisely locate an object to within three meters of its true location on the Earth's surface. The satellite will also be able to collect up to 700,000 square kilometers of panchromatic imagery per day. ^ a b c d e "ITT Corporation 2017 Annual Report Form (10-K)" (XBRL). United States Securities and Exchange Commission. February 14, 2018. ^ "ITT Corporation 2016 Annual Report Form (8-K)" (XBRL). United States Securities and Exchange Commission. February 14, 2017. Archived from the original on March 16, 2017. ^ a b "ITT History". ITT Inc. Archived from the original on 2017-08-03. Retrieved 2017-08-02. ^ "At A Glance | ITT Inc". www.itt.com. Retrieved 2019-01-09. ^ a b "ITT to break itself up, fueling share rally". Reuters. January 12, 2011. Archived from the original on July 1, 2012. Retrieved July 14, 2011. ^ a b Jacobs, Karen (July 14, 2011). "UPDATE 1-ITT sets names for planned spin-offs". Reuters. Archived from the original on July 1, 2012. Retrieved July 14, 2011. ^ Sobel, Robert (2000). ITT: The Management of Opportunity. Beard Books. pp. 35ff. ^ Macintosh, Norman B.; Paolo Quattrone (2009). Management Accounting and Control Systems. John Wiley and Sons. pp. 155–6. ^ Ingham, John N. (1983). Biographical dictionary of American business leaders, Volume 1. Greenwood Publishing Group. pp. 62–4. ^ Farnsworth, Emma. "Farnsworth, Philo T. and Elma G." J. Willard Marriott Library, University of Utah. Archived from the original on 14 July 2014. Retrieved 8 July 2014. ^ "KONI shock absorbers". Archived from the original on 2015-05-18. ^ Knippers Black, Jan (1977). United States Penetration of Brazil. The University of Pennsylvania Press. pp. 40–49. ^ Langguth, A. J. (1979). Hidden Terrors: The Truth about U.S. Police Operations in Latin America. New York: Pantheon Books. ^ Green, James (2010). We Cannot Remain Silent: Opposition to the Brazilian Military Dictatorship in the United States. Durham and London: Duke University Press. p. 89. ISBN 978-0-8223-4735-4. ^ Burn Before Reading, Admiral Stansfield Turner, 2005, Hyperion, pg. 99. Also see the article on Humberto de Alencar Castelo Branco. Also see BRAZIL MARKS 40th ANNIVERSARY OF MILITARY COUP Archived 2008-11-20 at the Wayback Machine, National Security Archive, George Washington University. Edited by Peter Kornbluh, 2004. ^ Ancona, Vincent S. (Fall 1992). "When the Elephants Marched out of San Diego". Journal of San Diego History. San Diego Historical Society. 38 (4). Archived from the original on 2013-07-05. ^ Stout, David (January 30, 2003). "Edward Korry, 81, Is Dead; Falsely Tied to Chile Coup". The New York Times. Archived from the original on May 12, 2013. Retrieved May 5, 2010. ^ The Pinochet File: How U.S. Politicians, Banks and Corporations Aided Chilean Coup, Dictatorship Archived 2015-09-12 at the Wayback Machine. Democracy Now! September 10, 2013. ^ Montgomery, Paul L. (September 29, 1973). "I.T.T. OFFICE HERE DAMAGED BY BOMB; Caller Linked Explosion at Latin-American Section to 'Crimes in Chile' I.T.T. Latin-American Office on Madison Ave. Damaged by Bomb Fire in Rome Office Bombing on the Coast Rally the Opponents". The New York Times. Archived from the original on May 12, 2011. Retrieved May 5, 2010. ^ Associated Press (23 November 1997). "Obituary: Harold Geneen, 87; Led ITT's Growth for 18 Years". The New York Times. Archived from the original on 27 March 2016. ^ Viswanathan, T. Telecommunication Switching Systems and Networks, p.225. ^ Magnet, Myron; Andrew Evan Serwer (11 November 1985). "IS ITT FIGHTING SHADOWS -- OR RAIDERS?". Fortune. Archived from the original on 29 April 2014. ^ a b Chapuis, Robert J.; Joel, Amos E., Jr. "IX-7: "The ITT (now Alcatel) System 12"". 100 Years of Telephone Switching. ^ "ITT Earnings Decline 33% for 3rd Quarter" Archived 2011-12-24 at Wikiwix, Los Angeles Times, 5 November 1985. ^ Bartlett, Christopher A.; Ghoshal, Sumantra (2002). Managing Across Borders (2 ed.). Harvard Business School Press. ISBN 978-1-57851-707-7. ^ ITT Telecom Archived 2016-12-20 at the Wayback Machine, The New York Times, 26 June 1984. ^ "ITT Makes Sale To Southern Bell" Archived 2016-12-20 at the Wayback Machine, The New York Times, 21 March 1985. ^ Hinman, Catherine. "ITT Division In Brevard Will Furlough 60" Archived 2011-12-23 at Wikiwix, Orlando Sentinel, 14 March 1986. ^ "ITT Accepts $3.6 Billion Alcatel Sale" Archived 2016-03-06 at the Wayback Machine, The New York Times, 4 March 1992. ^ "COMPANY NEWS; Metromedia Deal For 2 ITT Units" Archived 2017-12-19 at the Wayback Machine, The New York Times, 16 March 1989. ^ "Company News; Starwood Lodging in $2.1 Billion Deal with Vnu". The New York Times. 1997-12-19. ISSN 0362-4331. Retrieved 2018-05-29. ^ Nunez, Michael (September 6, 2016). "ITT Tech Is Officially Closing". Gizmodo. Archived from the original on September 6, 2016. Retrieved September 6, 2016. ^ Center, Arbitration and Mediation. "WIPO Domain Name Decision: D2001-0166". Archived from the original on 2001-06-10. ^ Lindsey, Sue. "ITT Fined $100M for Illegal Tech Exports"[dead link], Associated Press, March 27, 2007. ^ Cullen, Drew. "ITT Fined for Illegal Exports" Archived 2011-02-24 at Wikiwix, The Register, 27 March 2007. ^ "Consent Agreement, 2007: ITT Corporation" Archived 2009-10-10 at the Wayback Machine U.S. State Department, 2007. ^ "ITT fined $100 million for illegal exports". CNN. 27 March 2007. Archived from the original on 28 March 2010. Retrieved May 5, 2010. ^ "ITT Corp. Acquires EDO in $1.7B Deal". Archived from the original on 2016-08-17. ^ "Archived copy". Archived from the original on 2011-09-23. Retrieved 2009-01-03. CS1 maint: Archived copy as title (link) 67 (block): The International Telephone and Telegraph Building, erected in 1928 by Garment District developer Abraham Lefcourt as the Lefcourt Exchange Building, was almost immediately bought by ITT--which expanded the building to take over the whole block by 1930. ^ Holusha, John. "Commercial Property /75 Broad Street; Turning Buildings Into Telecommunications Hubs" Archived 2016-03-16 at the Wayback Machine, The New York Times, 10 October 1999. ^ Deutsch, Claudia H. (21 May 1989). "REFORGING THE 'GENEEN MACHINE'". The New York Times. Archived from the original on 28 August 2016. ^ "International Telephone & Telegraph ITT Information and History". Archived from the original on 2016-03-29. ^ "Radio Tower Demolished". The New York Times. 5 April 1996. Archived from the original on 22 July 2010. Retrieved 2010-07-23. ^ "ITT Avionics Gets $19.6M Air Force Pact". Bergen Record. 19 September 1991. Archived from the original on 18 May 2013. Retrieved 2010-07-23. ^ (August 20, 2004.) "ITT Industries Receives Contract for $24.9 Million." Archived 2012-04-20 at the Wayback Machine Impeller.net Archived 2011-11-01 at the Wayback Machine. Accessed November 2011. ^ "Consola "pong" Tele-Match (versión con paddle) (1977)". retroordenadoresorty.blogspot.it (in Spanish). Archived from the original on 1 May 2018. Retrieved 14 February 2018. ^ "ITT DIGIVISION 3447 OSCAR YEAR 1986". Obsolete Technology Tellye. Retrieved 14 February 2018. ^ "Kellogg Switchboard & Supply Co". Dictionary of Leading Chicago Businesses. Archived from the original on 18 August 2015. Retrieved 15 February 2018. ^ "Über ITT - ITT". www.itt-deutschland.de (in German). Archived from the original on 17 October 2017. Retrieved 15 February 2018. ^ "Nokia Announces Final Sale of its Television Manufacturing Business - Nokia". Nokia. Archived from the original on 2017-07-29. ^ "Über Karcher - ITT". www.itt-deutschland.de (in German). Archived from the original on 22 December 2016. Retrieved 14 February 2018. ^ Demerjian, Dave (25 October 2007). "As Skies Grow Crowded, FAA Preps Air Traffic Control 2.0". Wired.com. Archived from the original on 14 June 2013. Retrieved 25 May 2013. Araskog, Rand (2000). The ITT Wars: An Insider's View of Hostile Takeovers. New York: Beard Books. ISBN 978-1-893122-38-3. Bucheli, Marcelo; Salvaj, Erica (November 2013). "Reputation and Political Legitimacy: ITT in Chile, 1927-1972". Business History Review. 87 (4): 729–756. doi:10.1017/S0007680513001116. Calvo, Angel. "State, firms and technology. The rise of multinational telecommunications companies: ITT and the Compañía Telefónica Nacional de España, 1924–1945." Business History (2008) 50#4 pp: 455-473. Klein, Naomi (2007). The Shock Doctrine: The Rise of Disaster Capitalism. New York: Metropolitan Books. ISBN 978-3-10-039611-2. Ledbetter, Rosanna. "ITT: A multinational corporation in Latin America during World War II." Historian (1985) 47#4 pp: 524-537. Sampson, Anthony (1972). The Sovereign State: The Secret History of ITT. London: Hodder and Stoughton. ISBN 978-0-340-17195-0. Sisaye, Seleshi. "Contingencies influencing the effectiveness of acquisition-based corporate growth and development strategies: the case of ITT, 1920-1997." Leadership & Organization Development Journal (1998) 19#5 pp: 231-255. Sobel, Robert (1982). ITT: The Management of Opportunity. New York: Times Books. ISBN 978-99925-2-968-3. Sobel, Robert (1999). The Rise and Fall of the Conglomerate Kings. New York: Beard Books. ISBN 978-1-893122-47-5. Sutton, Antony (1996). Wall Street & the Rise of Hitler. New York: Buccaneer Books. ISBN 978-1-56849-726-6. This page was last edited on 17 April 2019, at 22:38 (UTC).